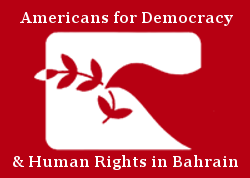 As Dr. Abduljalil al-Singace’s protest nears its 250th day, join Americans for Democracy & Human Rights in Bahrain (ADHRB) and Scholars at Risk in pressuring authorities to revisit his conviction and ensure his well-being. Scholars at Risk calls on supporters to send letters, emails, and faxes respectfully urging the relevant authorities to reconsider any convictions related to Dr. al-Singace’s peaceful exercise of free speech and association and to ensure his well-being and access to medical attention while in custody. Dr. al-Singace has boycotted all solid food in protest over the torture and ill-treatment of prisoners in Bahrain since 21 March 2015. Visit Scholars at Risk’s website to send a letter and learn more. To show support on social media, send well wishes to Dr. al-Singace by sharing a picture of you and a greeting card for Dr. al-Singace. Messages should be nonpolitical and refrain from mentioning his sentence. Take a photo with your card and share it over social media by tagging @ScholarsAtRisk and using the hashtag #SingaceHungerStrike. For more information on sending Dr. al-Singace a greeting, visit Scholars at Risk’s website. For more information on Dr. al-Singace’s case, click here.